OMEGA™ twisted/shielded thermocouple wire is ideal for systems sensitive to induced voltage and electrical noise. 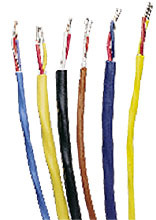 The wire conductors are insulated with color-coded PVC, then twisted with a tin/copper drain wire. Next, an aluminized polyester tape is wrapped around the wires, followed by a final layer of PVC coating. The wire is UL listed for Power Limited Tray Cable (PLTC) applications. Examples of pricing for popular models is referenced in the "To Order" box. Use the "Part Number Builder" below to get pricing for other available models.